I teach University Biology students about Turner Syndrome every year, and what surprises many students is that Turner Syndrome is not always diagnosed at birth, or even in early childhood. In fact, some women with Turner Syndrome don't realise they have it until they reach maturity. I used stamps from CAS-ual Fridays, Wplus9 and Lil' Inkers Designs. 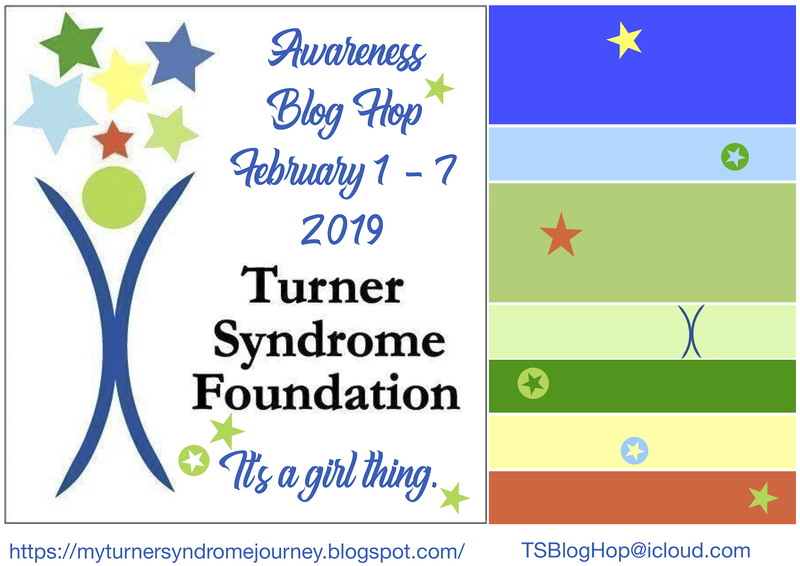 Make sure that you visit the "It's A Girl Thing" Turner Syndrome Awareness Inaugural Blog Hop page to become eligible for prizes! I'll be sharing this at the Simon Says Stamp Wednesday Challenge, where the theme is "Anything Goes". 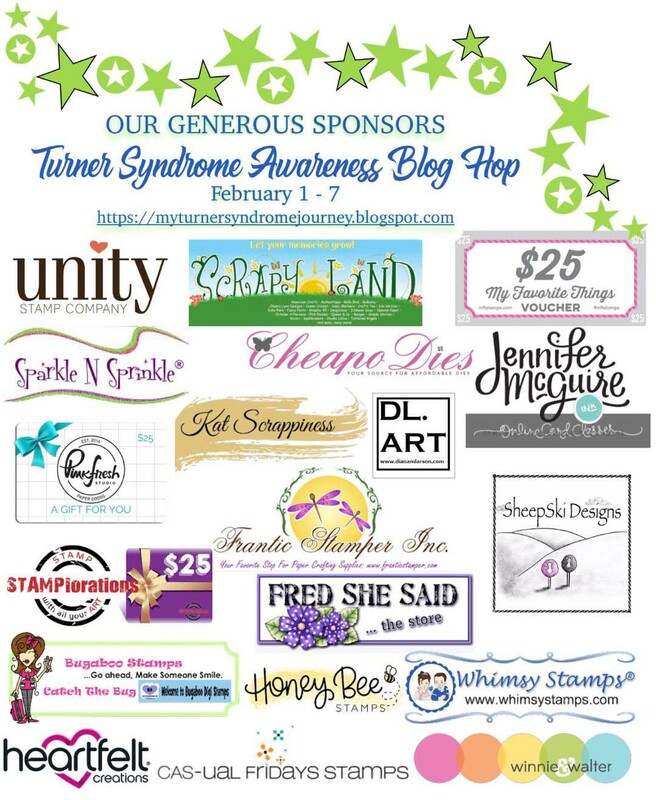 Michelle ~ Thank you for being a part of this Blog Hop and for teaching your students about Turner Syndrome! Your card is delightful! I love the beautiful flowers on it, it really makes me smile! What a delightful card, Michelle! I enjoyed learning that you do the awareness in each of your Biology classes. Like you, I find it surprising that it is not something tested for immediately, rather than waiting for the parents and child to endure all sorts of "what am I doing wrong" thoughts, or "what's wrong with my child?" The expenses are tremendous both fiscally and emotionally! 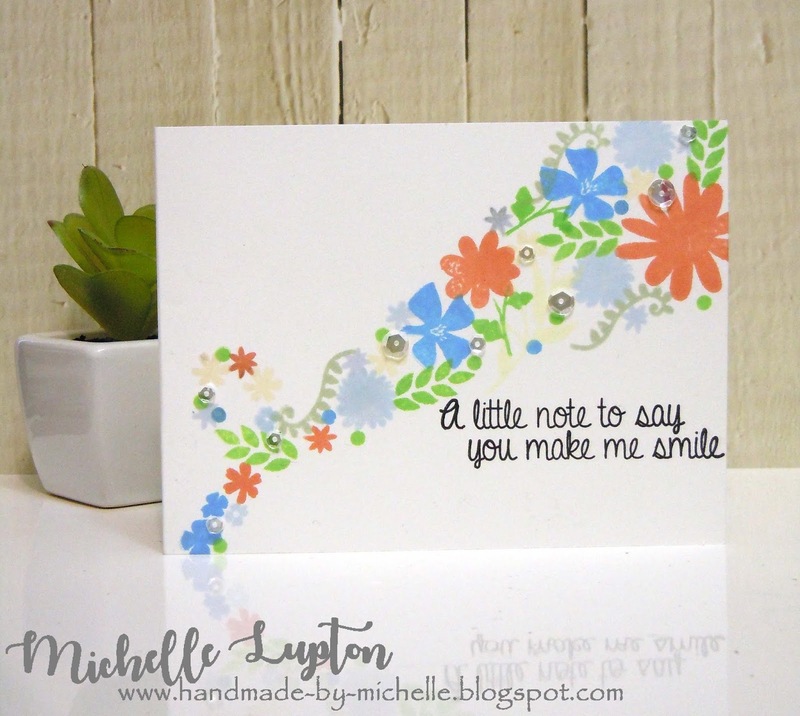 Your happy, dancing flowers in the TS colors are perfect with the sentiment! Leaving you with wishes for a wonderful day. Such a beautiful card, the colors and the layout are sweet!!! This is so cute. Just love your color-themed bouquet! Very clever! This is so beautiful!! I love the pretty stamps you used!! It's so gorgeous!! What a beautiful CAS card! I love your sweet design! Your card is so beautiful Michelle! Love how you incorporated the Color scheme from TS official board! The sentiment is so cheerful and loving! What a beautiful card. In love with the composition. Beautifully created with all the pretty colors, lovely design too! such a lovely card - love it!! This is such a sweet card. Love the colors and the sentiment is wonderful. Beautiful! I love this card design! Thank you for bringing awareness to this syndrome and being a part of this hop! This is so pretty! Loving that color palette! Your work rocks! Such lovely card! what a lovely flowercard for the TS-bloghop! Your card is so pretty, Michelle! Great use of the color scheme and I like how you stamped the flowers in a widening ribbon. Love the sparkle you added too! Such a pretty card, what a beautiful way to spread knowledge . Thank you for being part of this hop, really enjoyed reading your post. I love how you used the Turner Syndrome colors on your pretty card. So clean and fresh looking! Thanks for helping spread the knowledge too of Turner Syndrome. I was unaware of it. Oh Michelle this is so delicate and beautiful! Great job! What a soft and pretty card. I love the trailing of flowers and the sweet sentiment. Thanks for helping spread information about TS! Such a pretty and sweet card, Michelle! I love flowers and also an elegant shimmer :) I remember learning about this along with all the other chromosomal disorders in university nearly 30 years ago. It is amazing how one chromosome can affect a human's development YET how resilient we are to overcome and live without that one missing chromosome! Thanks for being part of this TS hop. I have never heard of this syndrome. I love your card! I love single layer cards and this is amazing! The way you incorporated the TS colors and the way it flows diagonally across the card are gorgeous. Love this sweet simple colorful card...my favorite kind!! Wonderful card, love the flowers. Thanks for bring awareness to Turner Syndrome. I really love the way those flowers just dance across the card! Your card is beautiful Michelle I love the soft watercolor design, thanks for sharing your creativity. Fun to be in the hop with you. Beautiful card! I love the flowers and the colors! Michelle, your delicate little flowers are great uses of some of the Turner Syndrome colors. The sentiment would give anyone a smile, and I'll bet you smiled the whole time you were creating this great card! Such a cute "little note"! Your card is so beautiful! I love the pretty flowers! Wonderfully sweet and beautiful card! Love the clean one layer design- fantastic! Thank you for sharing your card. This is such an interesting post about something I have never heard of. I worked in special education and can not believe I never heard of Turner Syndrome. I love your card. So bright and cheerful. Thanks for sharing. Sweet card, love the pretty flower colors! Pretty design and I like your choice of colors. 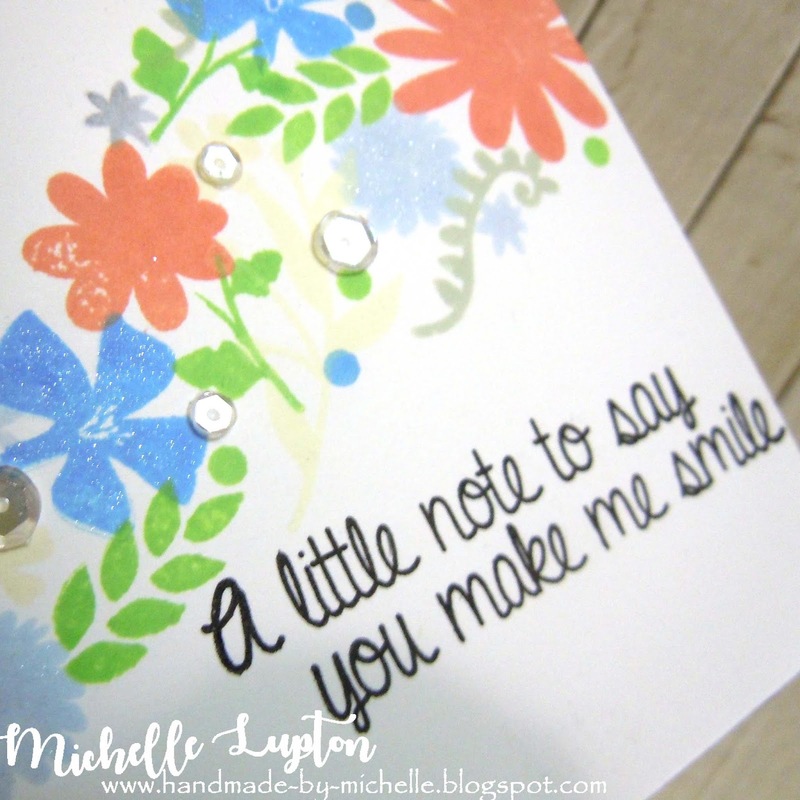 Michelle, I love the colors and layout of the flowers on your card. Such a pretty card. Your card is so pretty with that lovely drift of flowers!! Beautifully done. Beautiful sense of movement created along this lovely card. Thanks for your efforts to raise awareness of this cause. Nice combination of stamps from different companies! This card is so pretty! I love the colorful cascade of flowers and leaves! They feel so fresh and hopeful! Thank you so much for being a part of this important hop! Wonderful card. Love the soft colours. Lovely card with soft colours like the girl. The wording encourages the little butterflies. Thank you for taking part in the Inaugural Turner Syndrome awareness Blog Hop to make us aware that such a condition exists among girls. May you be blessed with gd health and happiness always. Hugs and loads of love from Sri Lanka. Thank you, Michelle! I love your card! Very simple and sweet. 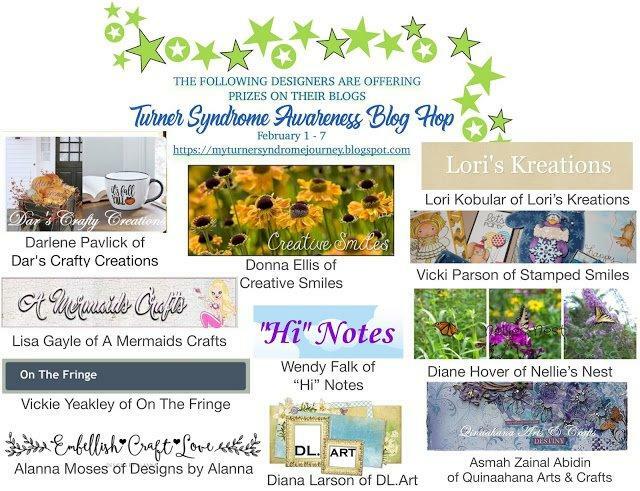 I was not aware of Turner Syndrome until taking part in this blog hop. Thank you for enlightening me! Love the way your floral trails off in a curl!